"I've had a couple of very charming meetings with him he's very bright. He's put together a more impressive front bench than was there before, but it seems to be all about image. I would really like to know a little bit more about what his vision is for the future of this country and his people. You know, some facts and some real policies rather than just a lot of almost throw away positions they take to change their image - so much so that if you believe everything he says there's not going to be an alternative between him and a New Labour government certainly." Mr Cameron uses an interview with this morning's FT to move away from support for a lower tax burden, however. He told the FT that: "When it comes to the economy, I am absolutely clear that stability and responsibility come first, second and third as our priorities - and that they come before the commitment to cut taxes." George Osborne will give a speech later today in which he will unpack this emphasis on stability. He is expected to emphasise tax simplification rather than tax reduction. Britain must compete in the global economy but Gordon Brown's taxes are endangering business' ability to do so. Last week's The Business revealed that UK tax levels are about to exceed those in Germany for the first time in a generation. Many of Labour's stealth taxes have fallen most heavily on the poor. William Hague and Michael Howard waited until the final months of the last two parliamentary cycles to start selling their modest tax relief packages to voters. David Davis used his leadership bid to say that tax relief was essential for growth-driven revenue growth and the challenging political case for lower taxation needed to be made for a whole parliament. Reducing levels of taxation and promoting economic stability are hardly incompatible, I should have thought. I think this is a good move from Cameron. As I said in a different thread on Friday, because of the misrepresentation of our past policies there is a great deal of mistrust whenever we start talking about tax cuts. We should put the emphasis on the goals tax cuts will help us reach, such as : a stable, prosperous economy and helping low earners. If we sound like we are talking about tax cuts for the sake of them it sounds like we are banging on from an dogmatic viewpoint. If we concentrate on the end goals we can start to argue the case that certain tax cuts are tools to do the job. The partner to that is to demonstrate how public services can be made cheaper and more efficient, with the added bonus of a lessened need for government revenue. Murdoch picks winners. He is not yet convinced Cameron is really a winner. A winner is not a follower, but a trendsetter. Cameron should show a little mettle and offer a tax-cutting agenda. Without it, he risks losing the initiative and his base. Moreover, their chief economic spokesmen (Portillo and Letwin) were the least enthusiastic and convincing proponents of tax cuts imaginable. I'd also add that the cuts proposed by Letwin were neither attention grabbing or likely to stimulate economic growth. I'm afraid this is another area where Cameron appears to have gone for the soft option, rather than advancing an argument about what the country needs. Our national competitive advantage in labour costs and flexibility against the eurozone has been all but destroyed by this government. Now it's done the same for taxes - as we've overtaken Germany in terms tax take. This will have terrible implications for our economy, whoch neither Cameron or Osborne propose to address. This is really sad. It's hard enough to cut taxes in government when you are really committed to them. The shallow/non-existent commitment of these two is dumb politics and dumb economics. Ut means we won't have an explanation or a solution when the economy turns down. A simplistic tax cutting agenda of the sort the party had under William Hauge and Michael Howard both lead to them being losers. If David Cameron fulls into the same trap he also will be a loser. Lucily for the party and countrys sake I think he as got a little bit too much sense to do that. A simplistic tax cutting agenda of the sort the party had under William Hauge and Michael Howard both lead to them being losers. No, the memory of the John Major government and New Labour's first term not being a disaster area made William Hague a loser (his leadership didn't help, mind). And Michael Howard did not have a tax cutting agenda. Under his leadership the party lost its tax cutting profile (a key totem for the modernisers), and actually campaigned on the basis of increasing public spending, making limited cuts through borrowing and hoping that efficiency savings would pay for it all. If David Cameron fulls into the same trap he also will be a loser. Is surrendering all arguments to your opponent really "winning"? Excellent post Mike Christie. I've said on here many times that members must increasingly understand polices in terms of those which are pre-election and designed to increase our credibility and (hopefully) popularity and post-election policies which can be implemented in government. Tax is a key example. Highlighting the need for stability and responsibility are important at this stage to increasingly convince the electorate that we can be trusted with the economy. If and when we win an election sensible tax cuts can follow. No body should ever doubt that we instinctively want to cut tax, and will do so but I think we need to be increasingly savvy about our economic pronouncements. I've said this on another forum but will repeat it here. Having seen the tax statements by Cameron this morning, I think they are fair enough in the short term. The public finances will be in a bigger mess by 2009. To promise tax cuts will probably require further borrowing and thus negative publicity from the start. Better to be trusted by small c conservatives in the country and once elected, plan ahead for tax reform and cuts (sharing the proceeds of growth). After all, Brown only earned his trust from the public by sticking to Ken Clarkes spending plans. Better to be trusted by small c conservatives in the country and once elected, plan ahead for tax reform and cuts (sharing the proceeds of growth). Except that there may well not be any proceeds of growth to share, especially as current trends show Britain consistently underperforming against growth expectations, and the eurozone - where countries are trying to reign in public spending - has outstripped us for the last three quarters. Cameron and the `modernizers´ are ruled by FEAR. This is the paradox. So seemingly self-possessed and confident, really they are very afraid. They fear that they cannot win the argument on tax cuts. So they concede unilaterally. Personally, I rather think that Cameron significantly under-estimates his own potential to sell the public whatever he wants to sell it. He has more talents than he gives himself credit for. Jack Stone: A simplistic tax cutting agenda of the sort the party had under William Hauge and Michael Howard both lead to them being losers. If David Cameron fulls into the same trap he also will be a loser. Lucily for the party and countrys sake I think he as got a little bit too much sense to do that. The problem with this before/after the election theory (mainly as Jack propounds it and to an extent also Frank Young) is that about the only subject on which it will work is tax cuts: promise nothing now, but discover once in office that there's scope to cut more than expected. The state of the public finances make that unlikely without a serious overhaul of expenditure priorities, and that would be difficult to achieve without an explicit mandate from winning a general election on such a platform. On other areas (grammar schools, patients passports etc) it would be very difficult to make specific Labour-friendly commitments now and suddenly unveil something more radical, and contradictory, in office. Apart from playing into the usual Blairite line of 'Tory secret agenda', it would also conflict with everything DC has said about consistency and trust, and about which I'm prepared to accept he is quite sincere. So the before/after theory really means: there are certain areas of the public services where we are committing ourselves to a neutral management whilst in office with a view to coming up with something more radical for the 2015 manifesto. To which Labour can say at that time: if reform's such a great idea, why haven't you done that already? I'm actually going to defend Cameron on this (*sharp intake of breath*). We haven't heard all of his policies yet, but lets focus on the social justice strand. The idea is essentially that voluntary groups will take up some of the burden currently shouldered by the vast and bloated welfare state. That will mean that the public purse will have to fund less activity, and that money can then be returned to taxpayers in the form of tax cuts. It is really a question of PR. If we say that we will cut tax without being able to properly show where the savings are coming from, Labour will ensure that voters will assume the worst. If we can show the cuts and properly justify the cuts, then we will, in the long run, be able to cut more tax. At least, I think (and hope) thats what he's planning. The case for tax cuts is morally and economically unassailable. Its just a question of selling it. That's the really sad thing about Cameron, he could have been the man to sell the reforming agenda which we've backed away from for so long. Instead, we continue along the path of New Labourite wishy washy centrism, which while looking good in the short term, is neither good for the party or (more importantly) the party in the long run. I wish I could believe that. I get the feeling from everything else he has said he has no such intention of doing so. That will mean that the public purse will have to fund less activity, and that money can then be returned to taxpayers in the form of tax cuts. The issue here is that the sort of social enteprises he's looked at have been set up with a substantial investment of public funds. In any case, they certainly don't offer the ability to cut taxes in the short or median term as they need time to "reduce demand" for services. is really a question of PR. If we say that we will cut tax without being able to properly show where the savings are coming from, Labour will ensure that voters will assume the worst. Supply side theory would suggest that the right cuts pay for themselves by generating economic growth, reducing evasion, and thus increase revenues. You cant really sell tax simplification but you can sell tax cuts. Tax simplification is great but if there are no cuts, its not going to stimulate the economy as much since the only savings being made is on administrative costs. Theres no substantial savings from the taxes themselves. The public are sick of both the complex system but also because of the ridiculous sums of money being shovelled to the Treasury. "Supply side theory would suggest that the right cuts pay for themselves by generating economic growth, reducing evasion, and thus increase revenues." You're right, but thats not how the public would see it after the Labour spin machine got to work. It would be the same old nonsense about "Tories cutting schoolsn'hospitals" that totally overshadows the fact that the heatlh budget, and to a lesser extent the education budget, could do with paring down. its not going to stimulate the economy as much since the only savings being made is on administrative costs. Not true. Tax simplification removes a lot of peverse incentives. This leads to better decision making and productivity. Also whilst those who pay income tax do not see the complexity of the tax system, all the self emplyed and small businesses do. These are a large enough constituency to go after with a tax and regulation simplifying message. ps. I think a simple tax code should be number one priority. The level of taxes comes later as you sort out the social democratic mess. It would be unreasonable to expect David Cameron to promise to cut x tax by x% at this stage. But it would be nice to know that we were travelling in the direction of a lower taxes, and a lower share of output going on public spending, under a Cameron-led government. 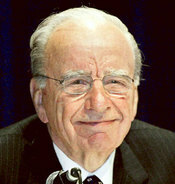 Jeff Randall allowed his dislike of Cameron to encourage Murdoch to criticise the Tory leader. I don't have the interview infront of me, but recall that he asked leading questions about Cameron pursuing image rather than hard policies, about the lack of courage to cut taxes and the intention to ditch the Thatcher legacy. I think Murdoch probably knows all that, John. What's arguable is whether the rebranding is being conducted in the right way, because raher than connect Conservative values to the electorate's values, it appears to put those values to one side. What Murdoch said is hardly a surprise anyway. It largely chimes with artices produced by Irwin Stelzer and the line taken by Trevor Kavanagh in The Sun. Stability and responsibility versus tax cuts? How can he think they're opposed? Tax affects the economy just like mugging, less is always better. Camerons just trying to distance himself from the past policy of tax cuts. By making that divide, he justifies the new policy...and cuts down a part of the Policy Group! Stability and responsibility versus tax cuts? How can he think they're opposed? What happens when John Redwood reports back announcing we need tax cuts....? Thats the big worry. Cameron is pre-empting the Policy Groups. As you said, what if Redwood calls for tax cuts...it could be damaging and Labour would have a new toy to play with. Not sure I know what we will do, but what I think we should do is put forward some specific proposals for eliminating self-evident waste in the public sector, and reduce taxes accordingly. I think we should do is put forward some specific proposals for eliminating self-evident waste in the public sector, and reduce taxes accordingly. That's what we did at the last election, isn't it....? It's clear these policy groups are merely a sham to buy Cameron time and avoid tricky questions. It seems Cameron (or Letwin et al.) has already made up his mind on these issues, and when the policy groups have served their purpose he'll kill them off quietly. "When it comes to the economy, I am absolutely clear that stability and responsibility come first, second and third as our priorities"
Remember back to the leadership contest when Cameron talked about being idealistc. Sorry but I cant really see how going on about 'stability, stability, stability' is idealistic. Whatever happened to creating a dynamic economy that can compete on the global stage with greater social mobility and individual freedom? If the argument is that by 2009 Gordon Brown's budget deficit will be so enormous that tax cuts will be sadly impossible in the short term, why not say so and put the blame squarely where it belongs at Labour's door? What was wrong with the Thatcherite policy of tax and public spending cuts to stimulate economic growth and liberate the forces of enterprise ? It worked so long as it was followed and before the disaster of joining the ERM. If the answer is that the zeitgeist is against it, then to quote Matthew Parris in the Spectator - zeitgeist shitegeist. I find it funny the amount of attention paid to Murdoch's political views. Undoubtedely like all business men he would like lower taxes (quelle suprise). But his primary interest as a businessman is ensuring he has good links with the heads of government to further his business interests. The Sun and the Times will only back Cameron if the polls look good and New Labour is collasping. The Tory manifesto or policies they come out with will have nothing to do with it. Incidentally his business status, also explains his loathing of the EU, who have increased regulation and blocked some of his business deals in the past. Murdoch in short is interested in one thing only, his business. What is amazing is the failure of much of the media to understand this. Well, Cameron is obviously a very gifted communicator. Unfortunately, he seems reluctant to use his skills to actually communicate Conservative policies in a way which is attractive to the electorate. Rather his approach seems to be that if we get in, we'll basically do as Labour do, but we'll be nicer people. I think you're right Andrew M.How else could one explain several Murdoch titles continued support for New Labour after eight years of increasing taxes and the growth of the 'nanny state'. If we look at his track record around the world it seems that the only thing that matters to Murdoch is that he backs a winner therefore if Cameron is still ahead in the polls before the next election Murdoch will back him if not,not. Although I'm fond of Murdoch as I used to work for him I really hope that Cameron does not court him in the way Blair does.It isn't healthy for democracy. Sean you say that Cameron 'seems reluctant to use his skills to actually communicate Conservative policies in a way which is attractive to the electorate'.Are you sure?How can you explain the more attractive polls of recent days? How can you explain the more attractive polls of recent days? By communicating non-conservative policies which are already attractive to the electorate? Also the polls dont have to reflect the policy changes. A lot of this is just public perception of Cameron by himself and ignoring the announced policies. Yes most people are totally ignorant of what Cameron's policies are. In fact, I think Cameron is benefiting right now from the fact that the public don't yet know just how timid he has been in terms of policy. When the next election comes around, and Cameron has nothing to sell that is different from Gordon Brown, he won't appear as the great hope to people's lives. Ultimately by positioning himself just where Labour is, he seems to be suggesting that the public are happy with Labour. I don't think that's so. I also think that the lack of a tax-cutting policy is very short-termist. By the time of the next election we could be in recession, and he will *need* to sound a bit more radical to sort it out. Sounding timid and not offering much that is any different is going to hurt his chances of portraying himself as the solution to all our problems when the time for that comes. Labour may now be so unpopular that simply *not* being Labour may do the trick. But it's a wasted opportunity I think. David Cameron's aim is to show his winning hand, but not now, not next week, or next year, but at the next general election. However, clearly he needs to build momentum, but this is not a sprint, and if all the boxes were ticked now, I'd be worried as how would you keep that running for three and a half years? The only real issue that would trouble me would be if we are still in the EPP at the end of 2006. That is one specific pledge that Cameron has clearly made and can deliver sooner rather than later. "David Cameron's aim is to show his winning hand, but not now, not next week, or next year, but at the next general election." You really believe that Cameron is intending to unveil some radical distinctive policies some time in the future? a-tacy all the points you make are valid.However all the same points (except 4) equally applied to the period before Cameron was elected when we were stuck on less than 33% in the polls.Surely we must give him credit for the change even if we dislike some of the changes that have been proposed such as the abandonment of grammar schools. "Surely we must give him credit for the change even if we dislike some of the changes that have been proposed such as the abandonment of grammar schools. " Giving him the credit does not mean that we should give credit to his policy positions. I don't believe, for example, that the Tories are at 38% in the polls because Cameron has abandoned the principle of selection in schools. His policies are already being unveiled. He cant go back on his promise over grammar schools or it looks like a U-turn. The manifesto is already being unveiled one piece at a time. If he makes bold statements they are essentially binding ones. He doesn't have to. All he has to do is called selection by ability in schools something else, say, "Specialist Ability Schools" or example. He has left many openings for himself in the future - some seem to be so blinkered that they cannot see that though. Sorry, my above post has appalling spelling and grammar. According to the Conference polls, Michael Howard was perceived as a whole 32 points more right wing than the Conservative Party itself. I therefore think that a major factor in the poll change since December 6th is that we're no longer fronted by someone who was viewed as both weird and extreme, even when he was being moderate. Whilst the first objective must be to remove the Blair government, surely some thought should be given to how a Cameron lead administration would differ. What's the point in winning if we are just going to do the same as 'the last lot'. Of course it would be foolhardy and frankly irresponsible to make promises of tax cuts at this stage. Without knowing just how bad the economy will have been damaged by Brown when we achieve power, we cannot promise to tax cut just like that. However, Cameron should be making a statement of intent: A desire to reduce the tax burden on ALL levels of earners as soon as possible into a Cameron administration - when it is safe to do so. Two wonderful ways to achieve this goal would be a serious consideration of the idea of Flat Rate Tax Regime, which works well in other countries, and a massive reduction in the army of Civil Servants that Blair has recruited (along with a genuine committment to cut waste in the Public Sector). Cameron must show the public, and the party, how 'Cameronism' is going to differ from 'Blairism'. Malcolm it may have been happening for years as you say, but its only the past few months that people's pockets have contracted, as their overtime reduces the impact of many of the items I identified start to impinge on their lives. My concern that by claiming credit for many of these changes people will expect him to deliver if he then can't because as I believe they are outside of his control then the damage can be large. On the subject of grammar schools, to be honest my area doesn't have any and hasn't for years, there is a grammar in an adjoining area and a few parents pay for extra lessons to pass the entrance exam (but worry about failing to get in and then not getting their second choice stopped alot of people applying last year). Two of my children would have been bright enough to get in to a grammar school but I didn't apply because of transport issues, the only area's I think this has harmed them academically is they aren't pushed sufficiently to exceed expectations, history and other humanities aren't streamed so the pace isn't fast enough, Information Technology is at far too slow a pace and two hours per week on pse are wasted on children who receive this parental type teaching at home. Saying this they love school and that's important. So the whole stress on Grammar's isn't very important to me I would rather concentrate on how to get the best out of everyone. Critics have been saying of Cameron's emphasis on streaming 'this has been going on for years', but, as a-tracy points out, there are many subjects - basically most humanities - where it is very rare for children to be streamed, for no obvious reason. Since children spend most of their time at school in the classroom, streaming for everything would be almost the same as having grammar schools anyway. Or am I missing something? "Saying this they love school and that's important. So the whole stress on Grammar's isn't very important to me I would rather concentrate on how to get the best out of everyone." You are absolutely right. Loving school is by far the most important thing. I went to a grammar and hated every moment of every day. It did nothing to get the best out of me. State education must provide a choice of learning styles and effective ways to exercise that choice. We need many more smaller, more autonomous schools. As for tax, I agree fully with Mike Christie and Frank. We shouldn't bang on about cutting taxes, not least of all because we probably won't be able to in the first few years. Our message should be about improving state-provided services by changing the culture behind them. as a-tracy points out, there are many subjects - basically most humanities - where it is very rare for children to be streamed, for no obvious reason. There is an obvious reason. Firstly, the benefits of streaming subjects like RE would be marginal at best, as these subjects become optional around Year 9. Secondly, there's a massive cost issue as most schools would find it impossible to stream all their classes due to restrictions in terms of facilities and staffing. I think people are going overboard on this one. We all support lower taxes, but we support them for a reason, and not just that it gives us more money to spend. It encourages innovation and enterprise and that ensures a high long-term growth rate for the economy. Our commitment to tax cuts has in the past not been connected with this by the electorate. By repairing people's perceptions of our motives first - in this case, economic stability - Cameron has allowed a four-year window for the case to be made that lower taxes (which he has not ruled out) and less state disincentives are the way to achieve this. This will then lead the public to be more in favour of smaller government, winning back the philosophical arguments by connecting economic prosperity with lower taxes and smaller government. I too sometimes get the nagging feeling that our increased popularity is worth nothing if we are the same as Labour. But then I read Cameron's speech on social justice the other night and there it was: empowerment over redistribution, a handup not a handout, meritocracy over egalitarianism: in short the reason why (even) a Tory government that looks and sounds a bit like Labour will still be far closer to all of our beliefs than will a Labour government. "there are many subjects - basically most humanities - where it is very rare for children to be streamed, for no obvious reason." A few days ago I put this exact question to my wife, who is a teacher. She said that the problem is managing the timetable when there are so many permutations of students, subjects and sets. Current systems rely on setting in the primary subjects and assume that ability in other subjects broadly follows. At first thought, I wasn’t 100% convinced that the timetable should be such an obstacle. However, I daresay that once you get into the practicalities of allocating teachers, classrooms, equipment, etc, it does become impossible to have a completely free choice of sets for every child and subject. Mark - does your wife know what is the argument against streaming the Form group that most of the lessons are delivered in? This is the only difference with Grammar schools in my opinion, grammars don't have the mixed form teaching so that distracted learners, slower learners and hard to teach pupils aren't slowing the pace of the whole group. A Conservative government will be committed to reducing the tax-burden. A Conservative government will reduce public spending as a percentage of GDP. A Conservative government will make a 'bonfire' of regulations, (and 'set the people free', as an earlier Conservative leader once said). A Conservative government will reform (not improve) the public services. A Conservative government will cull the useless parasites in the public sector who live of the sweat of the brow of honest labourers…(Sorry…getting a bit carried away there, but I think you know what I mean!) A Conservative government will reduce the size of the public sector. They can't the regulations that hurt are the ones that can't be removed; NMW, SSP (exposure now nearly £2000 - and how does a small business prove someone is taking the leak), SMP/SPL. A quarter of small businesses are so scared they'll get sued they won't tackle lazy unproductive staff. Extra staff holidays on a small growing business plus all the talk of extra bank holidays being thrown in who is going to vote no to that! It takes a while for factories to be set up in cheaper Countries, it takes time to transfer skills but what was a trickle is now a stream. The problem is that tax cuts only have the support of about 30% of the population. No matter how convincing the economic arguments in favour of tax cuts, people just don't want to hear them because they don't like the idea of "cuts in public services". It's like the economic arguments in favour of deregulation - people would rather put "workers' rights" before economic competetiveness. Sadly it may take economic stagnation to bring about the desired shift in public opinion (note the 1970s). I look forward to the day when China and India finally force us to smash up our bloated welfare system in order to compete with them. Three cheers for Randian capitalism. I agree with a-tracy, again. Streaming every subject individually may be impossible because of time-tabling difficulties. However, streaming form groups, so you have the same sets for english, history, geography, RE, etc. is much simpler, and if you're good at one of these subjects you're probably good at the others. This is what happened at my (private) school. Not having grammar schools would still be problematic for minority subjects, like Greek, where you don't have enough students to have sets, but the problem would be significantly reduced. The electorate likes the idea of tax cuts but when TORIES promise them we're seen as opportunistic bullshitters who want to take dosh away from hospitals to give to our rich mates. It follows that we should leave the idea alone while in opposition. Tom, my guess is that not many people sign up for Greek if they have no aptitude at it. i.e. all Greek students would probably qualify for top-set. The current system is effectively streaming by subject groups. This is more flexible than streaming by form but less flexible than streaming by subject. Why would you want to stream by form? It seems a step back from streaming by similar subjects. I would only want to stream by form/subject groups where streaming by subject would be too expensive, which James suggested was the reason why most state schools don't stream at all for humanities. In fact, I suspect that it is less impossible than people claim to sort out the time-table difficulties. It just takes a very clever teacher to be able to fiddle it so it all works. I don't think we should talk tax cuts we should talk about tax simplification, about economic competitiveness, about waste. about over regulation - educate the voters to the problems that result from over taxation. Then they will be receptive to a case for lower levels of taxation. A major campaign should also be on occupational pensions - Gordon's tax grab, regulations that force funds into investing in gilts so they have no chance of overcoming deficits, need to support personal investment in pensions. How Gordon has single handedly destroyed private pension provision, driven down funds investing in British industry so the make them work longer solution (unless you are in a gov't funded occupational pension) becomes the only answer. Destroy his reputation for prudence and competence on this and its easier for the rest of his financial trickery. Streaming and setting are different things. Setting is good (you're put in a class suited to your ability in a subject for that subject). Streaming is bad (you're grouped for a batch of subjects based upon your performance in some of them). The latter means that a child could excel in one subject, but be kept down a stream because of their ability in others, and thus be denied a chance to fulfil their potential. Yes, but streaming is better than no streaming, and where full-scale setting is impractical may be the best available option. Ability in one subject is often correlated with ability in others, especially when those subjects require similar skills. Having the same streams for english and history is obviously much less bad than doing so for english and maths. "Having the same streams for english and history is obviously much less bad than doing so for english and maths." All the subjects mentioned here are, academic. What happens to the students who have practical skills? They are left behind altogether, no amount of setting or streaming will rectify this major failing of our so called 'comprehensive' education. Yes, but streaming is better than no streaming, and where full-scale setting is impractical may be the best available option. Setting will always be practical for the core curriculum in all but the smallest of schools. Streaming for all subjects is as impractical as setting for all subjects. Streaming for all subjects is as impractical as setting for all subjects. If by 'streaming for all subjects' you mean having the same streams for every subject, I do not see why this is any more difficult than having the same classes not determined by ability for every subject. Setting complicates things because having lots of differently constituted groups leads to more potential for clashes. Having said that, I agree that every subject should be setted where possible. What happens to the students who have practical skills? DC has indicated that this will be a priority. I agree that on the face of it it would be much easier to cater for such pupils in some sort of secondary modern equivalent. If you don't 'set' the Form class on some sort of aptitude level you get a situation where the brightest spend a whole year back-peddling, and the children that need the most help slip back further. Fortunately the Maths group was set after the first term just for Maths, the English after a year for Year 8&9 but once in Year 10 the set's in humanities went out of the window to accommodate the range of choices - so the A grade students study at the pace of the C & D grades (also some in the mocks got F & G's in the same class so it wasn't helping them either). The problem with French, Geography and RS not being sufficiently stretching is that they become uninteresting and aren't followed after year 9. My child had 20 subjects to choose from at 13 years of age as well as compulsory Science/Maths & English, so I shouldn't grumble he had lots of choice. His French teacher did say he wouldn't get a decent job unless he took French but he had no interest in it, the teacher didn't engage him (he got 91% in his Year 9 test so it wasn't aptitude). If you want to deliver an education system based on AVERAGES and targets then only the average children will have their needs met, those at either end of the scale will be left out and suffer because of it. Isn't this an argument against Grammar schools you may excel in English and Humanities but be less able at Maths, Physics and Chemistry and not get in because of this or vice versa. If your form class was streamed for English/Humanities it could also be set for Maths and Science separately couldn't it? 1928 Rob - What happens to the students who have practical skills? Preparation for the uniformed services, and other practical options the school couldn't offer. My main complaint is that the subjects are delivered to too wide a group of abilties - lets say 60% of the children in that group are average then the 20% at the top and the 20% at the bottom are left out as long as about 75% get above a C.
Isn't this an argument against Grammar schools you may excel in English and Humanities but be less able at Maths, Physics and Chemistry and not get in because of this or vice versa. No it isn't. Grammar schools practised setting too and there's no reason why a secondary modern pupil can't take some academic students. Anyway, enough of this grammar school sideshow! Grammar schools have not been party polict since John Major was booted out of office. The real tragedy here is Cameron;s abandonment of the Pupil Passport, which would actually have revolutionised how schools work. But no, everyone would prefer to offer myriad variations in setting withing a failed state school model. I despair. I agree. If anything the Pupil Passport didn't go far enough. Let's have proper education vouchers. Please? Cameron abandoned the pupil and patient passport for a reason. It only gives opportunity to the rich (as most people think in linear terms). Admittedly, both would benefit society as there is less pressure on govt resources in education and health. Back to the thread, tax-cuts should come second or third in the scheme of things. No-where has cameron said that taxcuts are not important, and nowhere has he said that tax cuts are not necessary. What he IS saying is stability first, experimentation with fiscal and supplyside policies after. Yes! This debate on setting/streaming seems pointless. Let the schools decide. Let the money follow the pupil and you'd guarantee they'd soon sort out the best method. I'm sick of public schoolboys like Blair and Cameron telling me how great the comprehensive system is. It isn't. "And I find it amazing that everyone here seems limited to playing with a failing school model"
The idea that we can't talk about changes to failed tax, education and health systems in opposition but will somehow despite that be able to reform them in government is just a form of deference for some party members, with others it is wishful thinking and or simply misleading propaganda. The deference is the old Tory instinct of following the leader. When they say Cameron is being politically smart what they mean is that they want to believe that. The wishful thinking is contradited by the fact that Cameron has already said tax cuts will have to come out of sharing the proceeds of economic growth over the course of the economic cycle. That means no serious tax cuts at all. And he has ruled out the only serious way to reform education and health (not the grammar school and patients passport distractions but by ruling out vouchers and continental-style social insurance. The propaganda element that idiotically claims being quiet about change in opposition is somehow a recipe for radicalism in government is rather thinly disguised when one considers that the people who advance that theory are themselves opposed to radical changes to the tax system and to public services. I get that feeling too. If we run on a New Labour manifesto, we must govern as New Labour. Do we want that? There was quite a perceptive comment in the Sussex Uni paper in an article about Cameron, saying that he had created perceptions without committing to policies, so when he does come to unveil policy detail people will look at them with more open minds. What ot would have done is created a demand and supply side revolution in education with state, private and charitable providers all competing for pupils. The problem with that, Sam, is that he is giving specifics and ruling out specific options. However it was launched and explained so badly that the concept is currently too damaged to form a platform for our policy. We need a holding strategy that starts the process towards diversity & independence on the supply side while we work towards increasing parental choice and parental selection on the other - and maybe once we have regained trust and are recognised as a party as interested in the have nots as the haves, then surprise we can stumble across this revolutionary (albeit 18th century) concept and bring that in as part of our second or third term manifesto. However it was launched and explained so badly that the concept is currently too damaged to form a platform for our policy. Disagree. It was launched and explained so badly it is now forgotten, and people think that "a grammar school in every town" was our policy. In that sense it isn't damaged at all, and a competent salesman shouldhave no problems. Shame we have "Dave" then. So go on then James how do you get your child in to an oversubscribed school even with your £5000 in your hand in the year that your child needs to go there? When they can't find the extra teachers your £5000 can't fund the extra classrooms, the extended school hall, the extra teachers etc. There aren't enough places in the better schools for all the children who currently go to failing schools so as much as I appreciate your comments I just don't see how it can work. We have choice in Cheshire and it doesn't work, there are still children who don't get in to the third school of their choice for the very reasons stated above. Why? How are you going to pay for it all Jaz if you remove the incentive to work harder by taking more and more of people's income in tax and give less and less service for the money, as a greater percentage of the tax we pay goes on salaries, sick pay and pensions where is all this money going to come from. Everyone I talk to in the private sector, especially the small business sector, are getting absolutely fed up with it, we're cutting costs so why can't the government? The WHOLE POINT is that such schemes turnaround failing schools, enocourage new entrants into the market, and focus all schools on meeting their customers' needs. This is simply not possible in the current system - with the exception of some primary schools. We have choice in Cheshire and it doesn't work, there are still children who don't get in to the third school of their choice for the very reasons stated above. You're missing the point here. Choice itself is not the point. Choice is a mechanism that can allow accountability. The current model doesn't allow that accountability, because schools cannot fail and teachers cannot be cast out on the street for abject uselessness - except in the private sector. A voucher scheme in effect makes all schools private, and puts them under the same pressures to improve or fail. Why is it so hard to understand that if a good school is more attractive and other schools therefore face failure, that this motivates them to find ways to keep their pupils by improving? Makes interesting reading regarding tax and economic growth. Check out the table on page 24. What ot would have done is created a demand and supply side revolution in education with state, private and charitable providers all competing for pupils." True, but not quite, its the general impression of the whole policy, it comes down to one thing..and people will pick and chew on this and labour will make them..
"tories only care for those who have money". The public doesn't have "an extent to which" methodoligy in their head, its either good or bad...and if you havn't realised most people think that if a policy is Tory..its automatically bad. "Why? How are you going to pay for it all Jaz if you remove the incentive to work harder by taking more and more of people's income in tax and give less and less service for the money, as a greater percentage of the tax we pay goes on salaries, sick pay and pensions where is all this money going to come from. Everyone I talk to in the private sector, especially the small business sector, are getting absolutely fed up with it, we're cutting costs so why can't the government?" You know, I would absolutely love to spread the principals of conservatism.. But moderation is required.. We need to win first to do anything.. Preparation for the uniformed services, and other practical options the school couldn't offer." Seeing as I only left High School in 2003, yes I have been in one recently. I did Food Technology up to GCSE. If you are seriously considering that real coverage of practical subjects, only 2 hours every week, with limited resources and below standard teaching. The schools themselves dont consider the 'technologies' as important. How on earth can doing one slightly practical subject out of 10 be fair on those who have practical skills. The vast majority of school time for them is not aimed towards them. No wonder truancy is rife, if students dont feel a school is providing them what they need or enjoy, and have no option to leave that school, they will simply give up. The same goes for discipline. The current 'comprehensive system, focuses on academic subjects, neglecting a considerable amount of students, they also have poor standards teaching academic subjects. This massive state failure is crushing social mobility and has been creating a huge variety of social problems as well. Defenders of the current system are not just plain wrong, but they are condeming an entire generation to council estates and underachievement. "You know, I would absolutely love to spread the principals of conservatism.. But moderation is required.. We need to win first to do anything.."
By following this principle, we are conceding the argument to the left. Conservative Principles continue to be discredited, and when someone finally has the sense and courage to make changes, the task will be all the harder because people only interested in short-run power, will have made easy cop-out decisions. I did not join a political party to gain power, I joined to help see the principles I believe in acted upon. After all, as Keynes said, "in the long run, we are all dead." When Cameron, Blair and the rest of us are all dead and forgotten only our ideas will remain. Dont abandon them! Rob, I totally disagree, we are a political party as the main opposition, its our duty to become elected... the party is not a think tank. Our duty is to get the party into power, which favours the more capitalistic position, this doesn't mean a radical conservative agenda to get elected. Conservative prinipals can be applied once in office, if we never get there though.... I hope you enjoy the days of socialism.. Principals are useless if theres no opportunity for them to be applied. Cameron will get us elected with the right policies, and he'll probably bring the populus with hi into his successive second or third term. I say this that we lose the 2009 election, the hill is so steep thats its an almost impossible task... A hung parliament is possible..so the libdems will play a key role. A right-wing libdem leader would favour a coalition with us, a left wing means we get more votes.. Friendly advice Jaz: principal = main/primary, principle = value/concept. I used to do it all the time! By the way, did anyone notice Murdoch citing the 57% unemployment figure in parts of Scotland? It's one used by the CSJ, in Cameron's speech, and in my report on it. He seemed very keen on preserving this country's human capital with these education reforms etc. "I look forward to the day when China and India finally force us to smash up our bloated welfare system in order to compete with them." No thanks - I'd rather have a bloated welfare system than one which leads to rural infanticide and/or a booming population of undernourished, diseased street children. Jaz, a political party can be enormously influential in opposition. Think of how the Labour Party shifted politics to the Left from 1895 to 1945 without once having a majority. By your logic, they should have chucked in the towel by 1906 and proclaimed their fervent commitment to Capitalism and Empire. You can't pursue Conservative policies in office unless you have first persuaded the public of the need for them. "No thanks - I'd rather have a bloated welfare system than one which leads to rural infanticide"
The school only comes under commercial pressure if there is excess capacity in the system. If there is not excess capacity, vouchers can even work in reverse: the rubbish school still fills its places (because there's not enough local capacity) and can therefore cut its costs and quality without losing children. The real deal is that we have to increase capacity. Vouchers coupled with a right for the independent sector to set up voucher-schools can achieve this. But in that process, the big policy decision is to encourage private provision of state education, the vouchers are merely the funding mechanism. Not really. As has been pointed out ad nauseum, where voucher schemes have been introduced, even where there isn't a choice of schools, the change in the relationship between the parents and the school has served to drive up standards. the big policy decision is to encourage private provision of state education, the vouchers are merely the funding mechanism. The mechanism is an integral part of establishing the parent-school relationship, allowing private and charitable competition, and removing the dead hand of the DfES. Without that you end up with private money going to fund rubbish state schools (see City Academies).